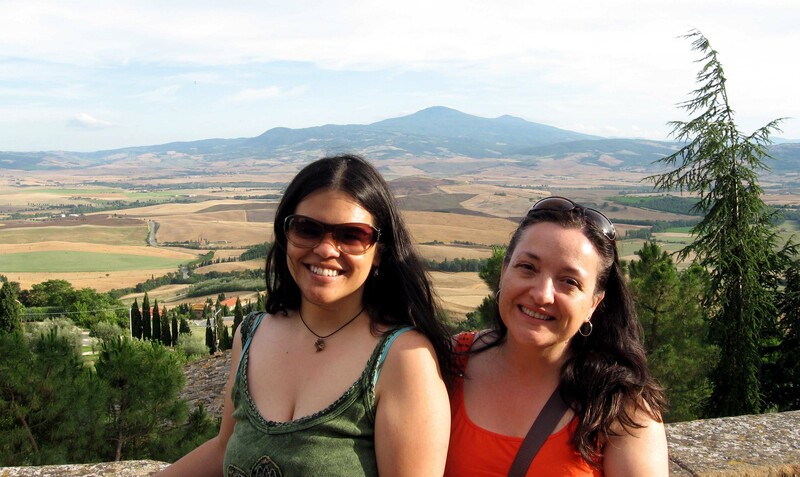 I wrote an email a while ago about my daytrip from Firenze to the Val d’Orcia with my amica Shannon. I have sent that same email so many times to friends planning a visit to Toscana that I thought it would make a great blog post. Hunger set in, but we did not want to take time from our adventure to sit in a restaurant. At the Generi Alimentari (grocery/deli) we picked up some local goodies…prosciutto, finocchione (Tuscan fennel salame), pecorino di Pienza, fresh bread, and 2 glasses of Chianti—all for 11 €! They put it all in a cestino (basket) for us and we ate outside in the piazza. It was the best lunch ever. 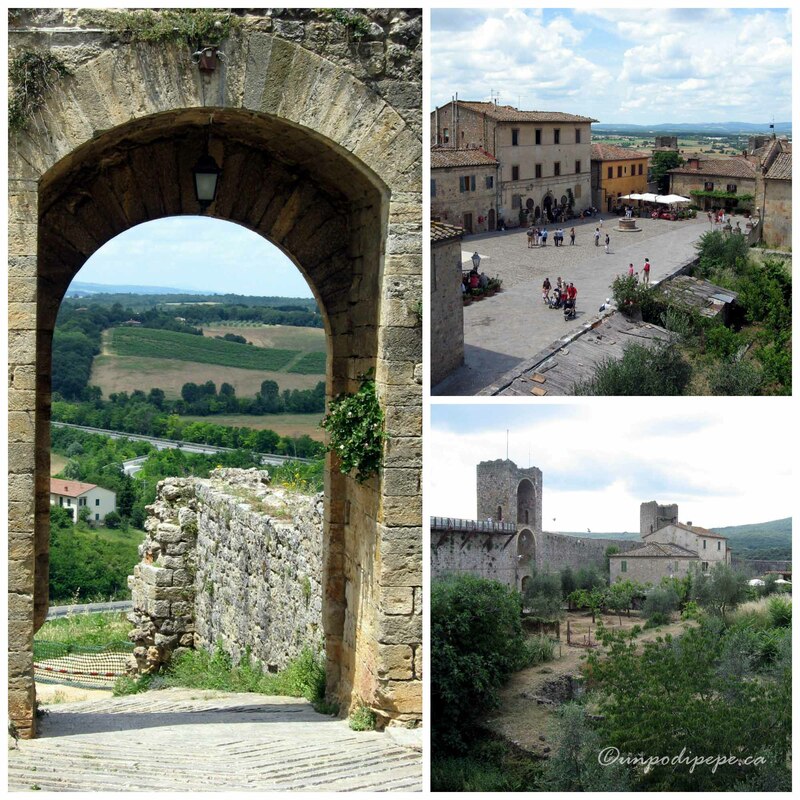 See for yourself…..
We got back in the car and headed towards the Val d’Orcia. 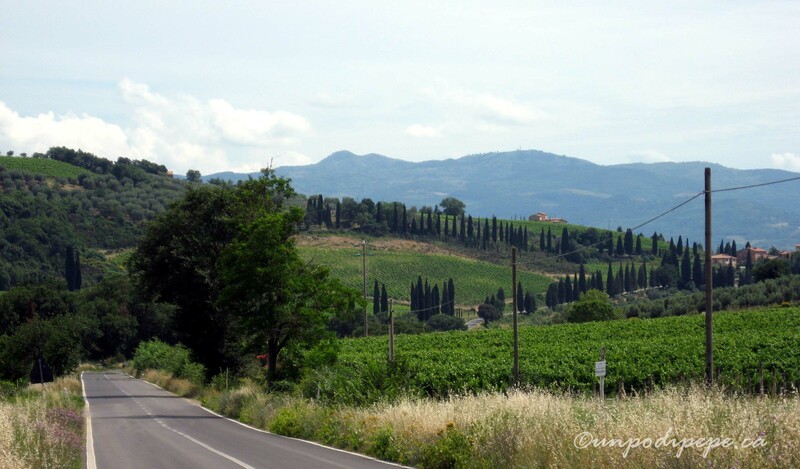 When you see photos or postcards of the classic Toscana landscape with gentle rolling hills, vineyards and cipressi (cypress trees)…this is it! 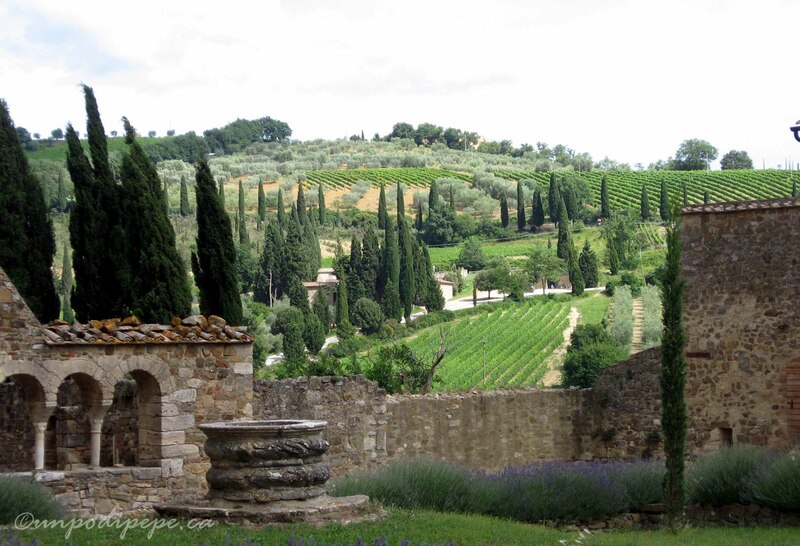 The entire Val d’Orcia is a UNESCO World Cultural Landscape. 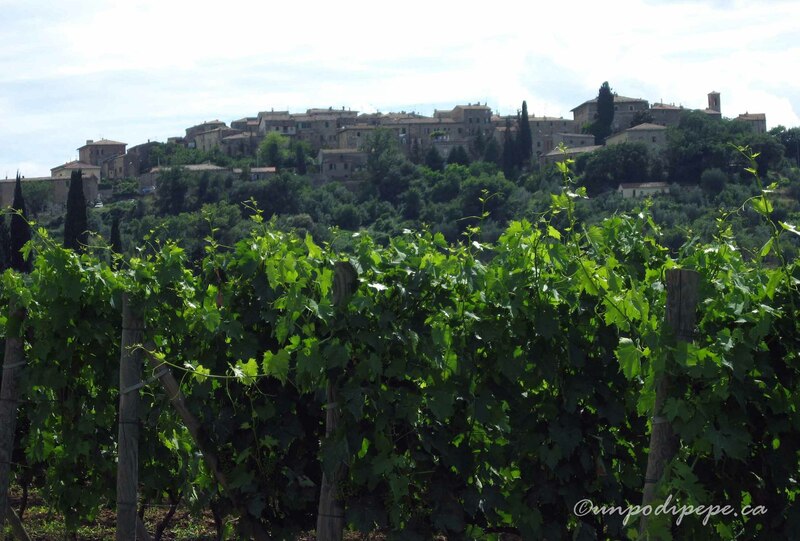 When we stopped in Montalcino, there was a sign for the Abbazia Sant’Antimo. I had recently read about this beautiful Romanesque Abbey, so we drove to Castelnuovo dell’Abate, parked the car and walked down. Sant’Antimo is a heavenly place, in a valley surrounded by vineyards, olive trees and cypresses. Parallel to the bell tower stands a striking single cypress tree. 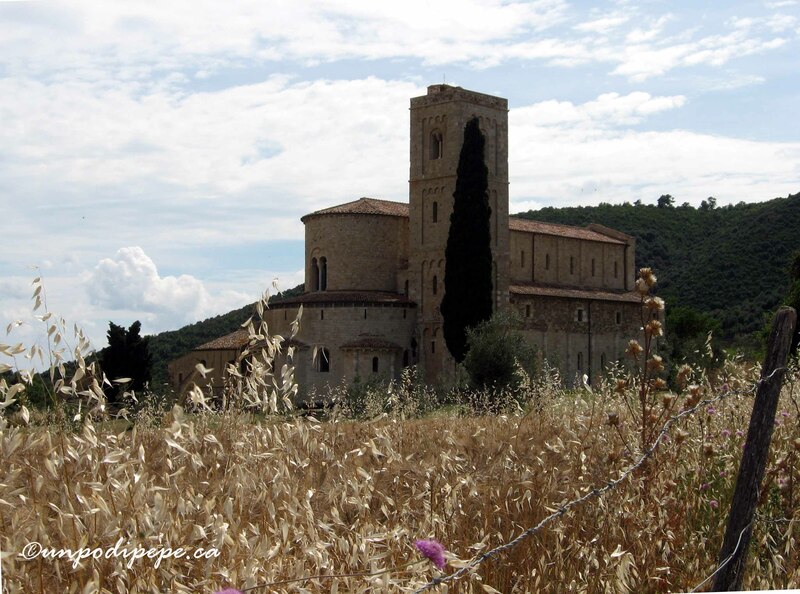 A powerful monastery in the middle ages, Sant’Antimo was abandoned for a short period of about 500 years! Local contadini (farmers) apparently used the crypt as a wine cellar! Restoration work was done in the 1980’s and now it is home to a small Canonical order. 7 times a day there are vespers and Mass with Canto Gregoriano (Gregorian chanting). Sant’Antimo is worth going out of the way for. Next time I am there, I want to walk the 10.5 km from Montalcino and take the bus back from Castelnuovo. Between San Quirico d’Orcia and Pienza the scenery was breathtaking, including one of the most photographed places in Italia, La Cappella della Madonna di Vitaleta. It is on private property so we weren’t able to visit, but we did lots of admiring from afar. There were cipressi (chee•PRES•see) everywhere! I have a fascination with cipressi and love to paint their ‘flame’ shapes and shadows. My nipotine have always called them ‘Zia’s trees’ and they love to paint them too. 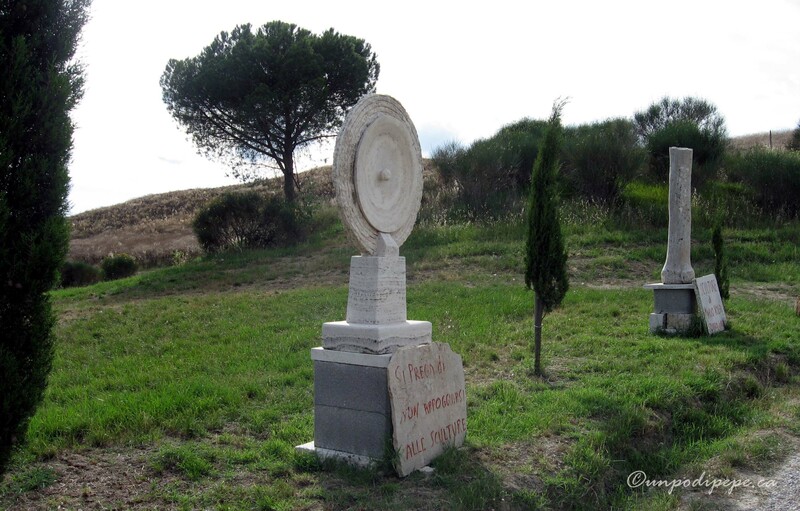 We came across some random sculpture among the cipressi with signs ‘Si prega di non appogiarsi alle sculture’ (Please don’t lean on the sculptures). 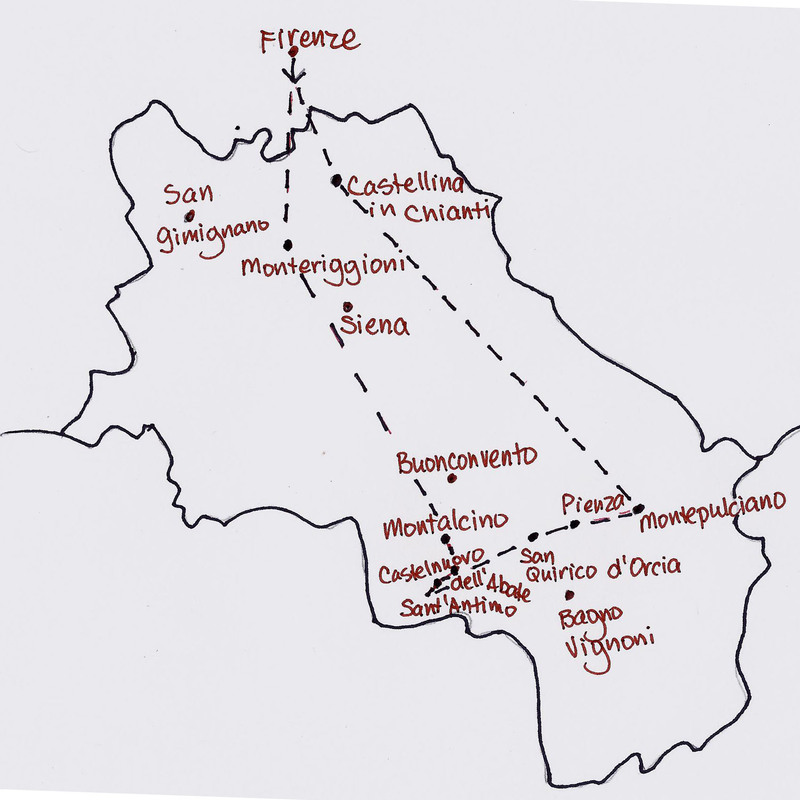 Pienza-formerly called Cortignano was the birth town of Pope Pio (Pius) II. In 1489, he rebuilt it to be an ‘ideal town’ according to Renaissance Humanist design concepts and renamed it after himself. He was a humble man! Because of this early vision of urban planning, the Centro Storico (historic center) of Pienza is a UNESCO World Heritage Site. I could have spent weeks sketching in Pienza! After a brief visit to Montepulciano we had to start heading back towards Firenze. Our final stop was Castellina in Chianti to have pappardelle al lepere (thick ribbon pasta with wild rabbit sauce) which was so yummy! The ride to Castellina was spectacular. We somehow ended up on a back road, the sun was setting and everything was sparkly and lavender! Just before mezzanotte (midnight) we arrived back in Firenze and dropped off the car. 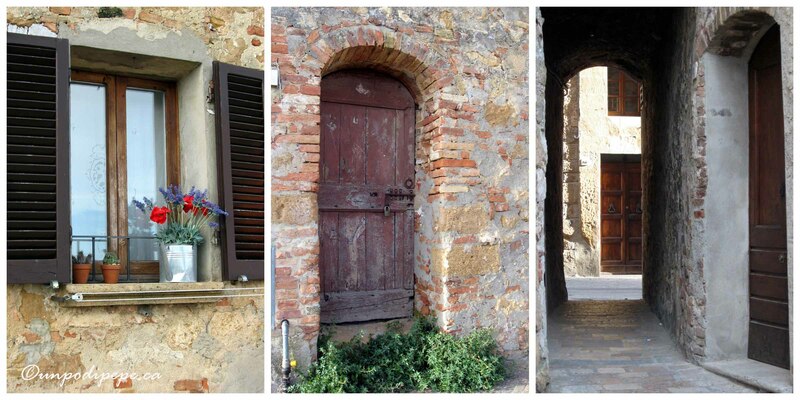 Our Val d’Orcia adventure lasted exactly 12 wonderfully unplanned hours. What a great post and a great day, thanks for sharing! I am a bit envious. 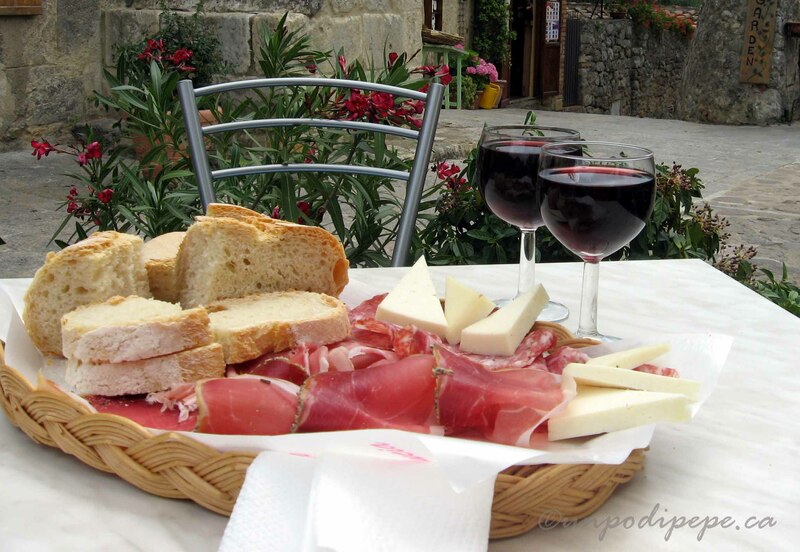 Your lunch of bread, prosscuito and cheese with healthy glasses of chianti looks just perfect! I loved Pienza and remember it as a very clean and attractive hill town. Hi Susan I used up a lot of sketchbook pages in Pienza and I didn’t want to leave. The finocchione was the best part of that perfect lunch. I can taste it now! Mmmmmm. I was thinking the EXACT same thing as Susan!!!! Fab photos…..so beautiful…and that lunch is to die for! Ahhhh…..the delicious memories we can take with us! What a day-I would like to follow in your footsteps! Mouth watering lunch! super post!